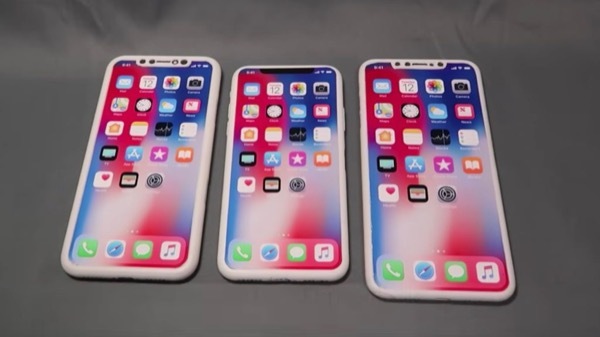 Channel Mac Otakara published a video in which bloggers have compared several artificial models of the iPhone 2018 in full size. According to the owners of the channel, one of the Asian parts suppliers to Apple has revealed the scheme’s final design of the flagship 2018. It is on the basis of these data, Mac Otakara has developed plastic dummies iPhone. Judging by the diagrams, 5.8-inch iPhone X will have the following dimensions: 143.65 at 72.03 at 7.69 mm. From this we can say that the updated model is 1.1 millimeter wider. Bloggers believe that it is the width taking into account side keys. 6.4-inch model is expected more: 157.53 on 77.44 at 7.85 mm. Compared to the iPhone 8 Plus the new model will be just a millimeter above and a millimeter already. This suggests that the aspect ratio of the display in the new devices will be the same as the iPhone X in 2017. The device will be slightly thicker. Apparently, this is due to the availability of advanced cameras, system, Face ID and the folded display in the lower part of the body. Apple bends the screen of the smartphone back to front panel was not “chin” as in Android smartphones. As for the 6-inch budget models, it also is not small: 150.91 on 75.72 to 8.47 mm. It is the thick model. What caused this is still unknown. Anyway, the dimensions of the devices allow you to learn a lot about future smartphones Apple. For example, fans of iPhone 8 Plus is sure to please that iPhone X Plus will not change in size, but will have a much larger display. But the 6 inch phone will be obscenely thick that, most likely, will scare away a large number of potential buyers.